Many consider Scotch to be the number one player in the Whisky World. Many also consider Grappa the crème de la crème in the World of Pomace Brandies. Compared to the other Pomace Brandies, Grappa is the only one that is World-renowned, mainly because of its importance in the Italian cuisine. After all, it is the first, and the last thing the Italians drink with a meal. The producer of this fine Grappa, Andrea De Ponte, was founded in 1892 by Andreo and Matteo De Ponte and is one of the oldest establishments of that kind in Italy. Its vineyards are situated in the midst of the hills of Asolo, Valdobbiadene and Montello in the heart of Veneto region. Grapes of all sorts are grown in this area, blessed with the sun and an abundance of fruitful soil, but Prosecco is special because it is used to make Italian dry sparkling wine. The fame of this sort grows since the Roman times. 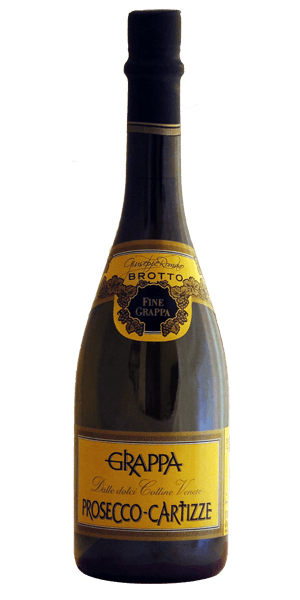 Brotto Grappa Prosecco Cartizze is made from Pomace from 8 different Prosecco grapes and is special because of its slow distillation method and short maturation period. A grade A digestible that is supposedly also a superb addition to an espresso. We concur. What about you? What does Brotto Grappa Prosecco Cartizze taste like? The Flavor Spiral™ shows the most common flavors that you'll taste in Brotto Grappa Prosecco Cartizze and gives you a chance to have a taste of it before actually tasting it. Bouquet of flowers and honey with pomace like aroma background. Graceful and mild yet affluent palate of almond, caramel, sage, anise, dry plums and liquorice. A clean and fine aftertaste with a well-balanced and harmonious palate that bring a smile on your face.